It was more than a year ago, when we reported and first heard that Research In Motion may be working on bringing its much-popular BlackBerry Messenger (BBM) service over to the Android and iOS platform. After a huge gap and small leaks here and there, we are back with some worthy leaked shots of BBM running on an Android device. 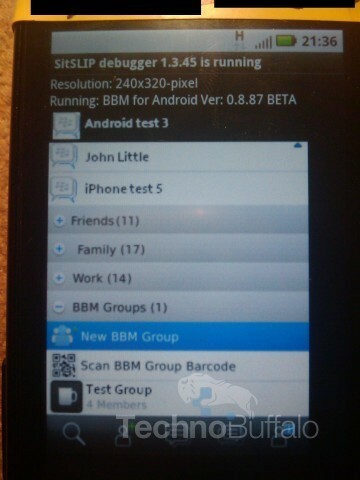 The leaked shot was sent by a person working on fixing the bugs on the BBM to TechnoBuffalo and show us BBM for Android version 0.8.87 running SitSLIP debugger 1.3.45 on a device which is having a 320 x 240-pixel resolution display, which is the same that is in the HTC Wildfire. It is also being reported that RIM may be planning to include this BBM for Android and also for iOS to its Mobile Fusion Package, which is currently available for enterprise users. We do not know of RIM will charge for the BBM on Android and iOS or would it be free. We expect the latter. Also the source who sent in this picture is suggesting that he BBM for Android is on schedule for a launch later this year but doesn’t go on to give a specific timeframe. Also the tipster is not aware as to when the iOS version of the BBM would arrive.